Berkshire Letters break the tradition of three-sided dressage letters and introduces square cones. Made of polyethelyne, the Berkshire Dressage Letters and the Berkshire Cube Letters are silk screened on all four sides. 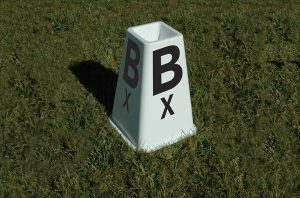 The Dressage Letters measure 22″ Tall w/16″ Base, and include an area at the top for flowers. The Cube Letters are 12″ Tall w/16″ Base. Also available are the Bottom Plates that slide onto the bottom of either cone which allows you to add sand for more stability in windy areas.